Today is the last day to enter to win a free copy of my novel Chasing Nightmares. If you haven’t already, hop on over to Laurie’s Non-paranormal Thoughts and Reviews and enter. The contest is at the bottom of my interview which includes an excerpt from the book so you will be able to tell if you’ll like it. I hope you do! Dr. Charles Levine despises his younger half-brother with a hate that even death can’t destroy. So why should he let Gordon’s demise prevent him from exacting revenge? His weak-minded nephew, who resembles his father in so many ways, would serve Charles’ purpose perfectly. 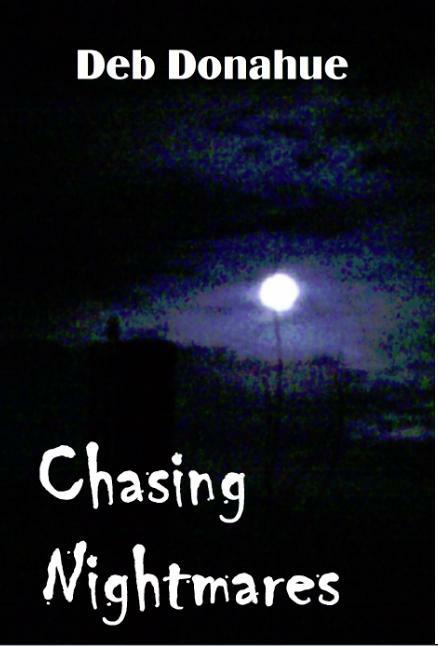 With romance, suspense, and a touch of madness, Chasing Nightmares tells the tale of Anne and Lee as they struggle to conquer the terrors that have haunted their dreams since childhood. Terrors that Charles exploits with finesse and specially concocted pharmaceuticals. Will Anne’s nyctophobia keep her from saving herself and Lee from the Doctor’s insane plans? Can Lee escape the yoke of addiction his uncle keeps pressing upon him? Or will their nightmares become their reality and devour them in the darkness? EXCERPT: The painting, still not completely dry, should have been one of peaceful beauty—a starlit sky, the moon lighting up the creek. But the night Lee had seen and the one he painted were two different pictures. Instead of the bright clarity of a summer night, Lee had painted an evil moment filled with ghosts of distorted images. The moonlit night took on an air of menace, full of vague, hidden terrors. It’s an hour to lunch time here and after seeing this recipe I’m thinking there is just enough time to run to the farmer’s market for a few special ingredients. Have you ever loved a book so much you wished you could live in it? If there was a vehicle that could send me into one of my favorite fiction worlds, just for a little while, I would buy a ticket. I doubt technology like that will ever be an option (although who knows!). But you can be the hero or heroine in your own mystery novel if you want to. And you can take along some of your friends and family, too. My mystery novel Through the Dark, published by PersonalNOVEL, is now available for purchase and can be shipped just about anywhere in the world. You can select the names and descriptions for the hero and heroine, their loyal canine companions, and two other characters in this Midwest mystery filled with chills and thrills and strangers at the windows in the dead of the night. Personalize this novel to feature anyone you want by changing names and descriptions. Great gift idea! Ships from the U.K. so allow 30 working days for production and shipping to the U.S.
A young woman inherits her grandmothers farm and, in need of a change, quits her high-powered job as a weather anchor to move out to the country. She gets more than she bargained for when her neighbor, Harlan Hunter, tries to persuade her to sell the farm. As if the pressure from Harlan weren’t enough, she is also battling nyctophobia  fear of darkness  and keeps seeing a mysterious stranger walking in the woods behind her house. With her faithful dog at her side, she decides to solve the mystery of why Hunter is so interested in the property, triumph over her fears, and discover who the mysterious man is. In her dream the pops turned to barks from Rufus. Miranda awoke with a start. “Rufus,” she called, realizing the barks were real. The dog was standing on her stomach, barking furiously toward the window at her feet. Thunder rumbled, followed by a flash of light, and in that brief second, she saw what had disturbed him. A face, white and distorted by the rain rivulets streaming down the glass, stared back at her. What made building a bit more difficult was the fact that we used 13 inch sandstone blocks in the alterations to match the existing house. Large sandstone blocks are typical of the old buildings in our area, but these days people tend to build with smaller blocks almost the size of bricks. We decided to stay true to the original since there were still 13 inch blocks strewn around the mountain behind our house left over from when my father-in-law employed a full-time stone mason in the 1960s. The blocks were carved out of big chunks of sandstone fallen from the cliffs above. He must have been a very productive guy because he carved all the blocks for the renovations that Bill and Karine did in the 1960s (including the building of a squash court) with more than enough left over for us! via Memories of the Vastrap renovation | Vastrap Farm. What writer doesn’t put a little bit of themselves into what they write? Here’s one of the questions I answered in an interview with OmniMystery News. If you enjoy mysteries, I hope you will click through to read the whole interview and learn about some of the other authors and books they highlight on their site. OMN: How much of your own personal or professional experience is included in the books? DD: Chasing Nightmares has little of my personal experience in it other than the setting I mentioned earlier. I don’t have nyctophobia or know anyone who does; I’ve never been addicted or suffered from migraines. Where the author comes through in this book is more thematic in nature than anything else. When I first started it, I had this near obsession with the “wounded male” phenomenon. That is, I felt especially sensitive to men with deep psychological wounds and wanted to nurture them all (especially if they were good looking and brooding). If you’re a Buffy the Vampire Slayer fan, think Angel in the first couple of seasons in particular. I’ve matured a bit since then which I feel makes the finished novel more realistic and less angst-ridden than it was in its draft version several years ago. The new cozy mystery, however, will take advantage not only of the places I knew from years of living in the rural Midwest, but all the gardening, canning, cooking and animal husbandry I engaged in. We raised and butchered cattle, pigs, and chickens in the early days of our marriage, and my basement was always well stocked with canned tomatoes, green beans, peaches, applesauce, etc. In addition, as a writer I have attended artist colonies so I am able to take the eccentricities from some of the creative people I know and mix and match them into my colorful murder suspects and victims. via Omnimystery News: A Conversation with Novelist Deb Donahue. I’m so excited. My first interview about my book Chasing Nightmares was posted yesterday at Laurie’s Thoughts and Reviews. We are also offering people an opportunity to win a FREE book. I’m going to be giving away one e-book (mobi or epub) AND a trade paperback, so there are actually two chances to win. I hope you will check it out, and good luck with the contest! There is a little café in the town near me that I intend to feature in the mystery I am writing now. It’s just a cozy place nestled among the boutiques and antique shops that attract big city folks from Chicago down to the area. It has homemade soups and specialty sandwiches and a country décor, but the best part is the absolutely delicious (!) homemade pies they bake daily. And we’re taking at least ten varieties a day, mind you. I’ve taken to following them on Facebook where they post the soups of the day and the lengthy, tasty list of pies. I wish I could go there every day and had room in my tummy for one slice of each! I’m am hard at work on a cozy mystery which I hope will be first in a series I am calling Coffman Cozies. Or sometimes I think of it as Coffman’s Country Art Colony Cozies, but that seems like too much of a mouthful, don’t you think? Through the series, I am living out a fantasy of mine but adding in a fun quirky murder mystery to spice things up. For years I lived in a little house in the country right next to a huge farmhouse and outbuildings that was the family home where twelve friends grew up with their parents. When the place went up for sale, I really wished I could buy it and turn it into an artist’s retreat, complete with farm animals in the barn. The first book in the series is titled A Bull By The Horns, and you can find out more about it if you like at the website I started. Grumpy bear, definitely. I have my little routine down: feed the dog, brew an espresso, walk the dog, eat breakfast. It’s odd that I used to be an evening person who liked to sleep in and stay up late. Because now I’m a zombie by ten at night and can’t sleep in no matter how much I want to. That’s doesn’t mean, however, that I am a productive morning person, unfortunately. I do usually manage to get to the computer by eight or nine in the morning, but until them I am a slug with my coffee and Good Morning America. Mysteries! Fondest memories from childhood include Hardy Boys and Bobbsey Twins (though I never did get into Nancy Drew for some reason). Then I moved on to gothic romance mysteries by Mary Stewart and Victoria Holt and the like. The first “book” I ever wrote in high school was a handwritten, very bad imitation of a Mary Stewart novel where the main character goes to Paris on vacation and ends up governess to the niece of a very handsome stranger she meets in a café. When I remember to take time to do it, just sitting outside and taking it all in is the best medicine. Once I calm my mind and take a few deep breaths, I can feel my muscles unclench. Then I can notice the small magical things around me: the rustle of the leaves, scudding clouds, squirrels scolding me. I lived on the west coast for a while and the most refreshing view was whenever I could just gaze out over the ocean, especially if there were mountains in the background.